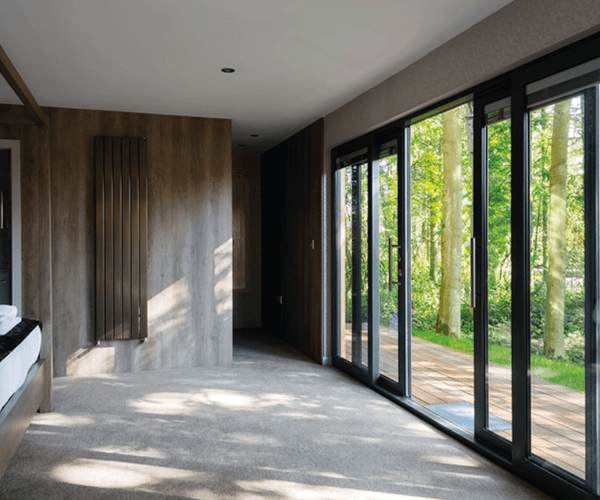 Our aluminium sliding patio door system is perfect for smaller openings up to 5 metres wide. This patio door features slim sightlines but is very secure. When coupled with low emissivity glazing, these thermally enhanced doors achieve very acceptable U values. These inline sliders are perfect for applications where it is desirable not to open in or out of a room and they offer a far larger glass area than a set of French double doors. Elegant and efficient in line system in a range of options with slim sightlines. Intended for domestic use – not high rise. We can supply any RAL colour, luxury textured effects or anodised finishes, which includes Marine Grade. All painted and finished in our advanced paint finishing facility at Kawneer Runcorn, in Cheshire.